It's Spider-Man's first Annual! The previous year (1963) saw the first couple of annuals for Marvel's superheroes, with the Strange Tales Annual #2, and Fantastic Four Annual #1. This year, with more titles under their belt and even greater confidence in their direction, you'd think that Stan and company might have several more ready for their readers - and yet the growth is a conservative, gradual one. 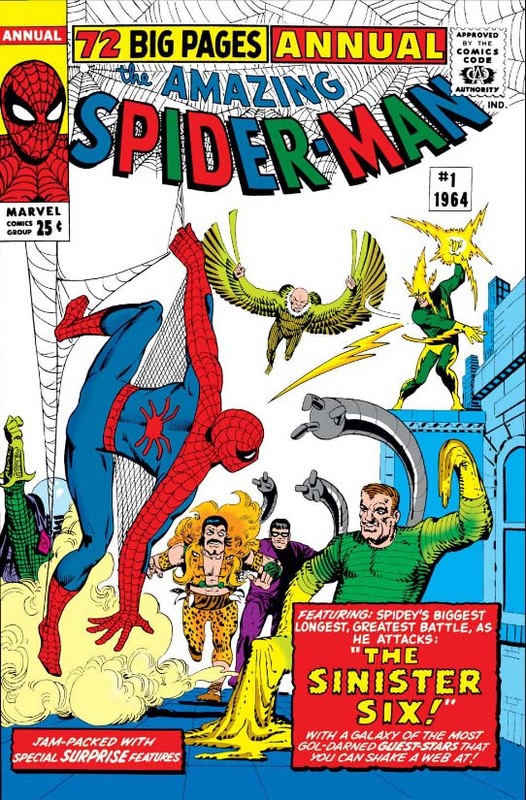 This first annual for Spider-Man came out the same week as Marvel Tales Annual #1 (an all-reprint book), followed a few weeks later by the Fantastic Four Annual #2 (published the same week as Millie the Model Annual #3) - and that's all for 1964! Sgt. Fury and Journey into Mystery won't receive annuals of their own until the following year, and books like The Avengers, The X-Men and Daredevil will have to wait even longer. This doesn't forward the plot at all. It's just incredibly, effectively funny. So, what's contained in this mammoth, 72-page package? Glad you asked! Stan Lee & Steve Ditko kick things off with a 41-page lead story (an increase over last year's 37-page epic in FF Annual #1); there's a wry caption at the start claiming that "It's taken us a year to produce this double-length epic," and you can almost believe it's true. Taking a cue from the aforementioned FF Annual, this is then followed up by 14 pages of "A Galley of Spider-Man's Most Famous Foes! ", full-page illustrations of every Spidey baddie to date (up through #15, at least). Nine pages of "The Secrets of Spider-Man" follow, discussing and explaining such elements as the "bitten by radioactive spider" origin, Spidey's strengths and abilities, his webbing, his mask, and beyond. Several more full-page illustrations follow, including not just a Spider-Man pinup - albeit one so iconic that it would be emulated a few years later for the cover of Spectacular Spider-Man Magazine #1 - but also scenes spotlighting Betty Brant, Peter Parker's classmates, Aunt May and their Forest Hills house, and occasional guest-stars the Fantastic Four. 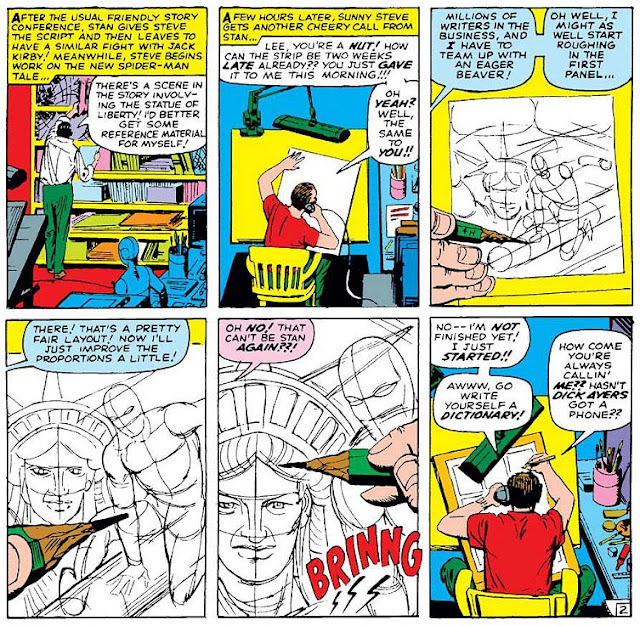 Possibly the most amusing bonus feature, however, is the 3-page strip that rounds off the package, "How Stan Lee and Steve Ditko Create Spider-Man!" In Stan's typically jocular fashion, it portrays the two men as haranguing each other over the course of days as Lee calls up Ditko at all hours with his new ideas, making demands both incredible and unreasonable, while Ditko's pencil flies along, trying to keep up. It's an enjoyable tale, clearly designed to give readers an insight into (a version of) the creation process, while unafraid to poke fun at themselves ... and yet, it's hard to read the blatantly parodic figures hurling insults and aggravations at each other, and not think of the legendarily acrimonious rift that would lead to Steve's departure in 1966.
last year's Strange Tales Annual #2? Over the course of the prior year, Stan Lee & Jack Kirby seemed to really embrace the "team of bad guys" concept, first introducing it with the Brotherhood of Evil Mutants over in the pages of The X-Men, then creating the Avengers' villainous analogues in The Masters of Evil. Here, Lee & Ditko offer yet another take on the concept, introducing an alliance composed of the most heinous baddies of a single hero - and then launching them at the poor hapless schlub! As we've seen, the Spider-Man villains to this point have nearly all been destined to be remembered as "the classics", and so it makes a certain terrifying sense to see them come together and pool their various, nefarious forces. Appropriately enough, the story opens on one of the villains, Doctor Octopus, in prison after his last bid of naughtiness. Having thought better of his last stay, the authorities have this time separated the bad Doctor from his tentacular additions, and locked them up. But then we find that Otto has learned to mentally control them from afar, thus using them to effect his own breakout! So we begin the tale with not just the returning menace of one of Spidey's top villains, but one who has suddenly received an upgrade. 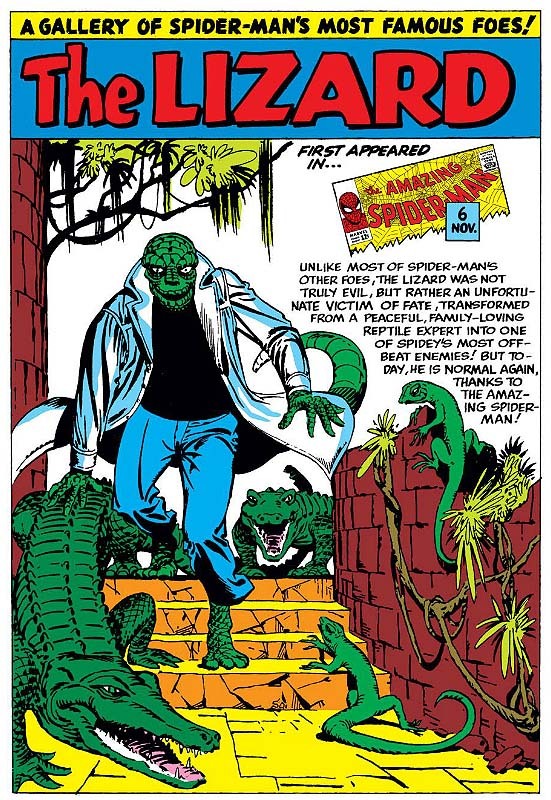 And if that wasn't bad enough, he in short order calls together the Sandman, the Vulture, Kraven the Hunter, Mysterio and Electro - to form the chillingly-named Sinister Six! On the downside, he's not in the Six. Then again, he's in the new movie and they're not! 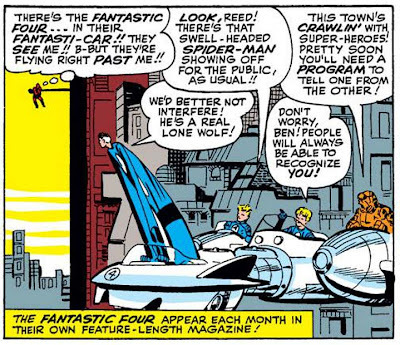 As much as this comic may rely on the past (assembling a team composed entirely of preexisting enemies), we should note that this appealingly-full package also takes pains to introduce Spidey's world for any new readers who might be encountering it for the first time. On the first page of the story, Spider-Man pesters Jonah in his office at the Daily Bugle, who rants "If only that blasted Peter Parker was here to snap some photos of him!!" Take a moment to marvel at how much information is delivered in that one moment: character points for both Spider-Man and Jonah, Peter's occupation at the Bugle, the two completely separate relationships which our hero has with the publisher, etc. Two panels later, a flying Thor narrowly misses our hero in mid-swing, thus establishing that this superhero solidly occupies the same cityspace as the other Marvels on the rack. 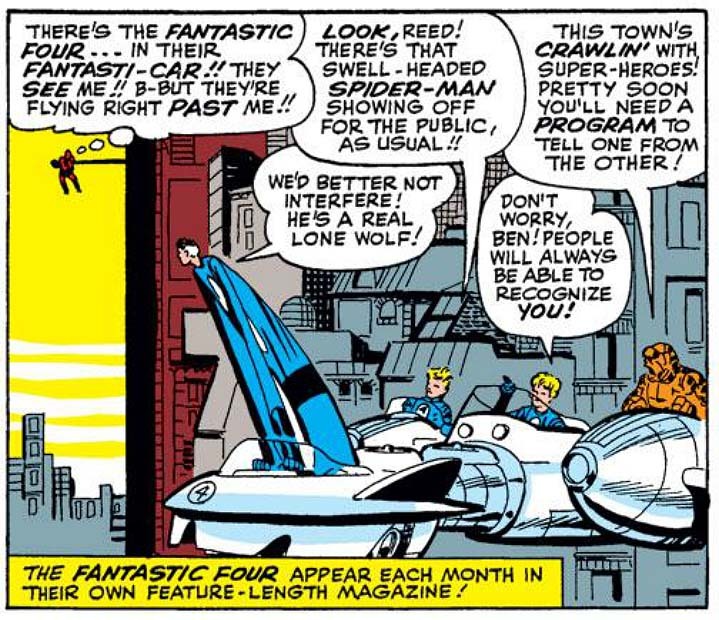 (Similar walk-on appearances subsequently abound by Doctor Strange, the Fantastic Four, Ant-Man and the Wasp, and more - all with helpful footnotes pointing the new reader to the monthly mags in which those characters appear.) And soon after scenes showing the teenaged Parker being bullied by Flash Thompson and other schoolmates, and the introduction of Aunt May, we're treated to a very short flashback retelling the origin of Spider-Man - although note that this flashback doesn't refer us to the original story from Amazing Fantasy #15, already two years old and thus unobtainable to readers of the day, but rather the reprint found in the Marvel Annual #1, on sale that very same week. And all this occurs in the first five pages alone! It's incredibly, undeniably impressive to see how masters such as Stan Lee and Steve Ditko could craft a tale which certainly rewards long-time readers, yet remains the perfect introduction for any kid who'd never read a Spider-Man tale before. Five decades later, Ben's words seem slightly prophetic. 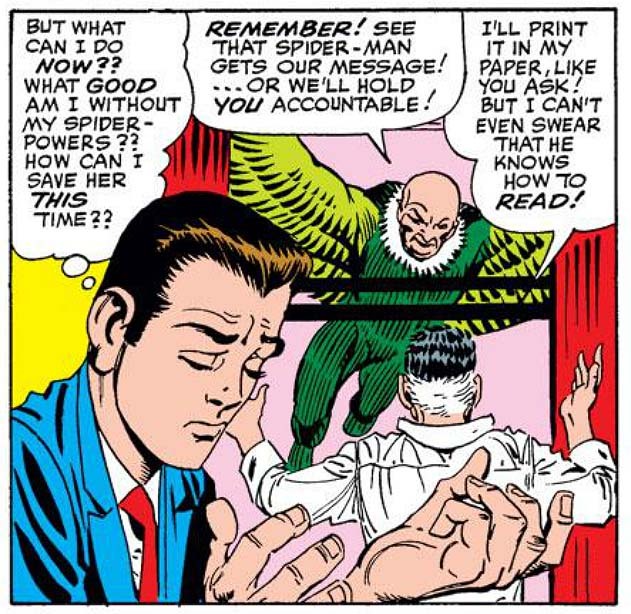 Also, note with amusement Reed's oddly dark description of Spidey! Pathos, menace and hilarity all in one place. After the requisite amount of stage-setting and plot maneuvering, the Sinister Six begin their deadly assault. And Doc Ock's ingenious plan is for the villains to attack him ... one at a time?! And not even in any strategically-conceived sequence, but rather ordered by a simple luck of the draw?! (One wonders, yet again, just how much the supposedly-brilliant Doctor's brain chemistry changed in his originating atomic accident.) And yet this seeming randomness appears to be contradicted when Otto tells the assembled villains that the cards they drew at random also list the sites at which they should engage their enemy: places chosen to be "best suited for [their] particular talents!" Well ... which is it? Were the cards distributed at random, or were they strategically distributed to each specific baddie? In what seems nothing short of an outright flub on the part of Stan Lee, the dialogue seems utterly and hopelessly confused on the matter. make the reader stand up and cheer. 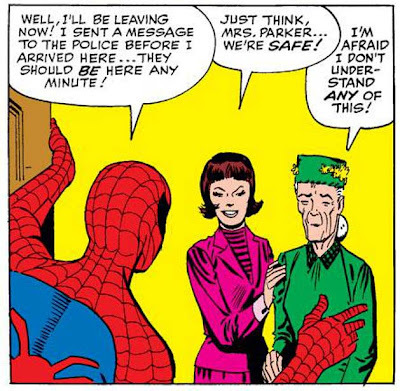 The bad guys kick off their plan by kidnapping Betty Brant (whom Doc Ock knows Spidey has fought for twice before) - and, coincidentally, the older lady she was meeting with: Aunt May. When Peter finds out, he immediately accepts the challenge laid out by the Sinister Six and goes to tackle them, one by one, despite the fact that he's now powerless. 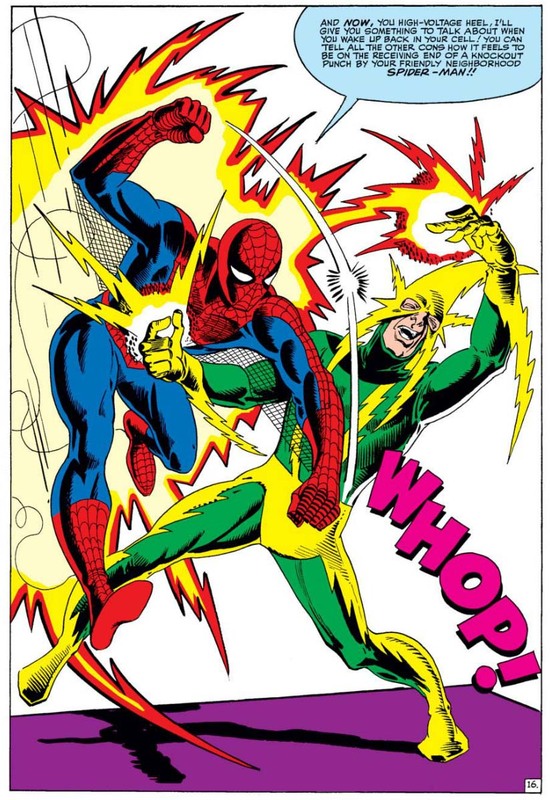 But on tackling his first foe, Electro, he's surprised to find that he can dodge the villain's bolts just as nimbly as before! Upon later reflection, he realizes he never lost his powers after all; he just imagined he did, as a psychosomatic result of the deep guilt he was feeling as he recalled the death of his lamented Uncle Ben. Each of the villains gets a full-page action shot in mid-fight. It's a neat device, and gives an unusual, welcome rhythm to the tale. Aunt May kind of a ditz?